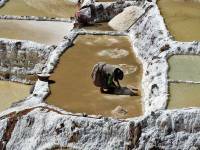 After our Intrepid Travel Tour of Peru was finished we stayed a couple more nights in Cusco. We moved to the El Virrey Boutique. This hotel is located right on the central Plaza de Armas. It faces directly toward the Cathedral. The staff didn’t speak any English, but I knew just enough Spanish to get by. It’s a perfect location and a great choice for seeing the June 24th annual Inti Raymi Festival of the Sun. The town was very busy the evening before the festival. We walked to the San Pedro Market and wandered up the hillside of San Blas in the cool evening air. 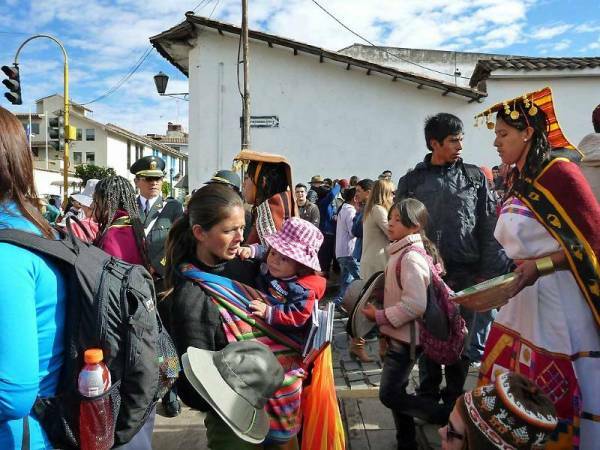 In the morning, it was a short walk from the central plaza to the start of the Inti Raymi Festival at Qoricancha, the former site of the Inca Temple of the Sun. 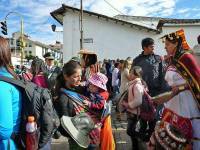 The festival starts a 9am on June 24th at the grounds in front of Qoricancha. It’s easy to recognize the location, because the Convent of Santo Domingo sits over top of the sacred Inca site. Access to the grounds was restricted to Inti Raymi Festival performers, so we stood close by at the corner of Ave el Sol and Santo Domingo. Just after 9am a parade started in a manner that’s totally different from any I’d seen before. Crowds of spectators filled the main street and all the side streets. Men dressed in military style uniforms were scattered along the main street of Ave el Sol. They looked menacing, like they were planning a coup. Perhaps they were there for crowd control, but they seldom moved. The spectators were an interesting mix of locals and tourists. Peruvians love to wear similar hats to represent their community. Many types of hats were on display in the crowds. 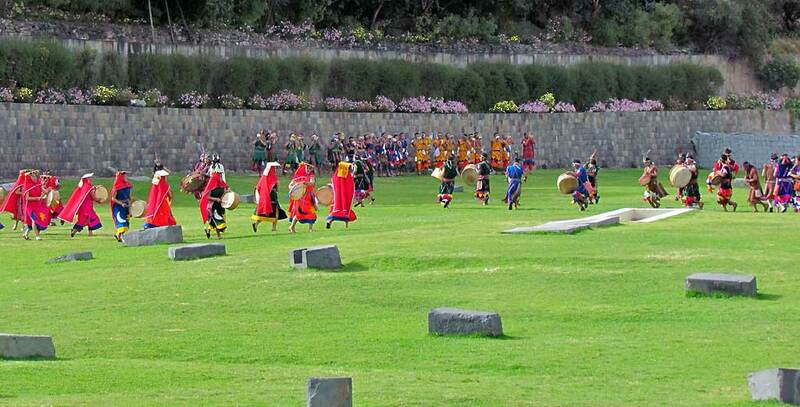 Suddenly the Inti Raymi Festival of the Sun performers started arriving. You could barely see them in the crowd. They came in a steady stream trotting quickly down Ave el Sol. The crowds were pressed so close that performers could barely get through. 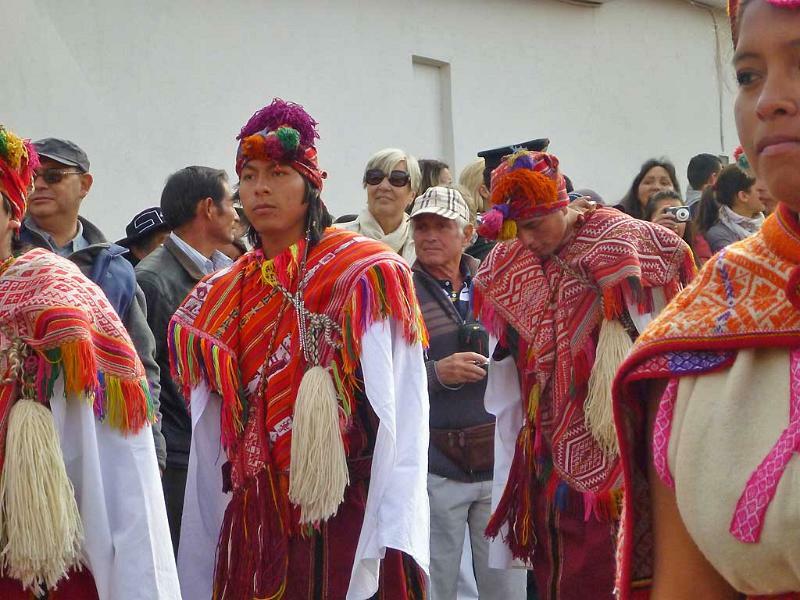 Performing men and women wore bright native clothing. Each group of performers had costumes in similar patterns. Several groups played flutes. Warriors arrived carrying spears and chanting. After one group passed, another group in a completely different clothing pattern would follow. It reminded me of sports teams rushing onto a field one after another. 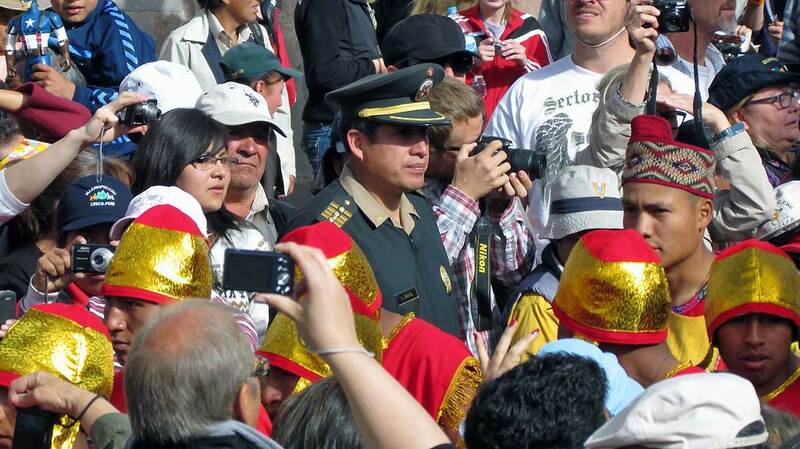 However, this event had a special atmosphere of reverence for Inca tradition. As we watched, the crowd around us began to jostle. 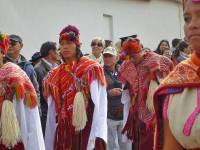 I realized that additional Inti Raymi performers were now forcing their way down the Santo Domingo side street that we were on. We were shoulder to shoulder with them, as if we were now in the festival parade ourselves. 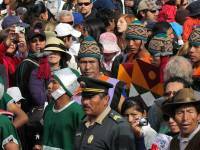 Once they reached the main street, they joined the flow into the grounds of Qoricancha. On the grounds, the colorful groups ran in patterns over the green grass. They created a feeling of happiness. 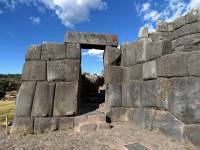 It seemed like the Incas had returned to take back their sacred temple. Ironically, at this point it was time for us to head out for our connecting flight for our Tambopata River Adventure. We made our way through the crowds to collect our bags from the hotel. The plaza was closed to traffic, because it was the next location for the festival. So, we walked several blocks until we found a cab to the airport. Many spectators would later follow the performers up the hill to Sacsayhuaman, where another ceremony is held at around 1pm. We missed a large portion of the Inti Raymi Festival of the Sun, but I felt very lucky to have been right in the middle of the intimate moments as it began.